In-Lect is an extension to the well known In-Tensive table series. In-Lect comes with wheels to make it easy to move around and to make different arrangements. The wheels can be locked and the tables can be connected into rows. With its folding top In-Lect is also very easy to store and manoeuvre. In-Lect has a spacy cable tray where you can install/store all the electrical, network etc. devices and cables. 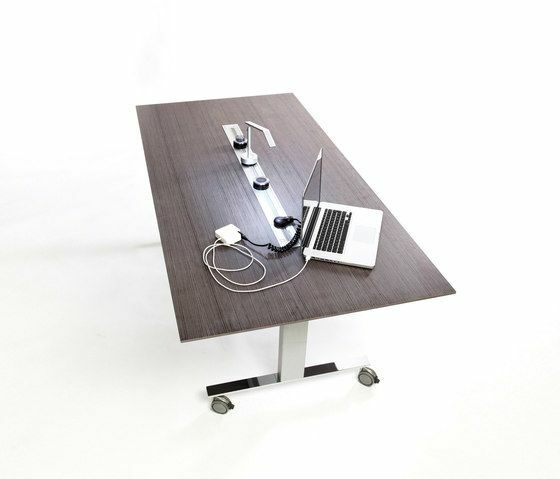 Model A has hinged flaps and model B has a recess power and cable management track integrated to the table top. In-Lect is a perfect partner for your mobile meeting sessions! In-Lect A/B-1400/1600: 1400/1600 x 700/800 mm In-Lect A/B-1800: 1800 x 900 mm In-Lect A materials: epoxycoated steel, MDF top and flaps. In-Lect B materials: epoxycoated steel, MDF top with integrated power track.